Strachans (Successors) was in a bad way in the early 1950s. Many of the vehicles supplied to operators in the 1946-1949 period had proven less than robust (due to poor quality timber), a fault shared with bodies produced by Santus and many of the smaller coachbuilders of the time. Nevertheless it was obvious that the firm would have to offer bodywork for the new underfloor engined coach chassis, and in 1951 the company produced its first five such bodies, all on Royal Tigers. Four went to Valliant of Ealing as WMT 321-324, and the fifth to Jackson of Guisborough (east of Middlesborough on the inland road to Whitby) as illustrated here. The "Cleveland Coaches" fleetname came from the Cleveland Hills which were there for several million years before Ted Heath invented the county of Cleveland! It wasn’t a bad design, although one suspects that the front corners owed more than a little to Windover’s "Kingsway" design. No more of this style were built as Strachans introduced their new "Strathrae" design in early 1952, and this was then replaced by the better known "Everest" model in 1954. Does anybody know what happened to GVN 952 after Jackson sold it? And does anybody have a shot of one of the Valliant machines? The reversed flashes round the front wheelarch give this coach a curious pushme-pullyou look! Of course full fronts were a new challenge for most coachbuilders at that time. At least we know the chassis would have been solid and reliable! It’s worse than that, Andrew. Adding to your observation is that the way in which the body flows downwards at the rear as in the front, giving a distinct impression that two fronts have been glued together! It even seems to have an early Morris Minor front grill fitted! It’s not quite an ‘Ugly Bus’ contender, but close. 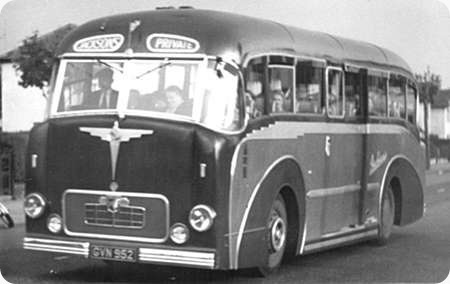 The Aldershot & District Dennis Dominant HOU 900 had similarly styled front and rear wings as built in 1950, but, in the course of its career, the "Tracco" removed these strange embellishments in favour of straightforward, simple wheel arches. On the matter of Strachans quality, it cannot have been as bad as some of the ‘mushroom’ bodybuilders of the forties and fifties, as the Dominant lasted for some fifteen years with A&D, and was apparently sold on for further service, though I am not sure where it went. It’s a very impressive looking coach but it could have looked so much better with deeper windscreens. It’s strange how so many coachbuilders at the time felt the need for the bottom edge of the screens (on underfloor engined chassis) to curve upwards to the centre and yet others proved it was quite unnecessary. Perhaps it was a carry over from producing full front bodywork on front engined chassis. The side has a decent line to it, the reversed flashes around the wheelarches do look a bit odd but no doubt another quirk of the time was that the front end had to match the rear. It certainly looks to be of substantial construction but that was nothing to go by as far as Strachans were concerned! According to available fleet lists, Jacksons were taken over by Saltburn Motor Services in 1957 and their four vehicles included this one. Saltburn operated it until 1962 but there doesn’t appear to be any further details.